Graduation is a time of accomplishment, change, and decisions about what comes next in your personal and professional life. 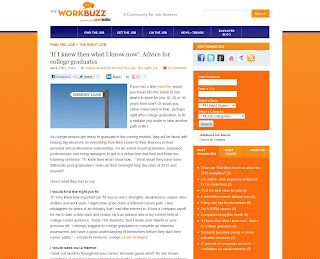 Debra Auerbach, a writer for CareerBuilder.com and its job blog, The Work Buzz, tapped me for my advice to college graduates for her article about what students should be thinking about post-graduation. The article highlights some great advice from professionals across a variety of industries with different backgrounds. They all have one thing in common -- the benefit of hindsight. Looking back, it’s easy to think of all the things you should or could have done to set yourself up for the career and future you’re striving for. So I encourage all of you graduating seniors (and everyone else!) to give it a read and learn from the experiences of others to make your transition from college to the real world a smooth one. And above all -- congratulations and best of luck in the future!